This is my first visit to Australia and wanted to experience the place where the Aboriginal people had this continent to themselves for well over 50,000 years. Anthropologists attribute the world’s longest enduring culture to the Aborigines. And its fascinating to see how their long-standing traditional motifs have morphed into stunning and such modern looking art, with their cross-hatched and dot-patterned painting styles. They are one of the most durable societies the planet has ever known..
One of the passions I share with my wife and co-teacher Laura is to better understand the wisdom traditions of indigenous peoples around the world. 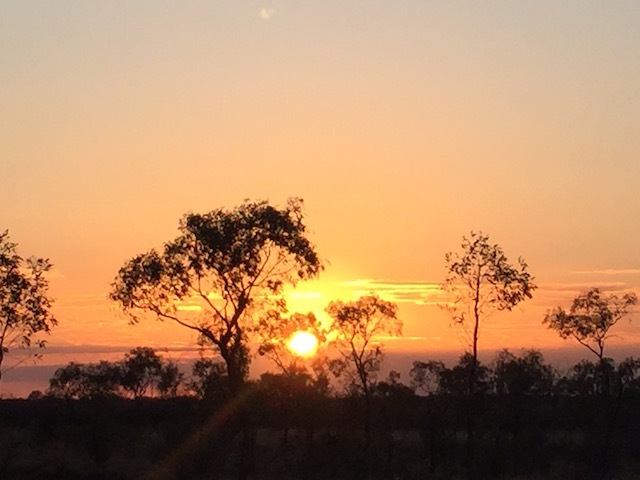 We were blessed on this journey to see so many sacred sites, to experience everyday life in an aboriginal camp, and to catch just a glimpse of the Dreamtime and the ceremonies of the elders. And for me the pinnacle of that experience was visiting Uluru. Uluru is Ayer’s Rock traditional name. It is one of the great natural wonders of the world, as we circumvented the six mile path around the world’s second largest monolith (the first is in Western Australia) we found it is also one of the world’s most mysterious religious sites. We passed one marker after another for men’s and women’s sacred sites and caves, requesting no photography allowed out of respect to the people who still conduct ceremony there. Uluru means meeting place, where tribal lands intersected. It was a good place to find food so when there was a good rainfall and food was abundant, the tribes of the area would all get together. Different areas had different purposes — the kitchen cave where food was processed, the learning cave for young boys, the old peoples cave, and initiation caves. Members of the tribe would go to these different areas and men and women had their own sacred spots to conduct “men’s business” and “women’s business.” Ceremonies and rituals conducted have deep ancestral meaning and still today, Uluru remains sacred to the tribes of the region who continue to perform rituals in the caves and refresh rock paintings. For the Aboriginal people, Dreamtime is the core of everything, and of the many sacred sites in Australia, few are as important as Uluru. It is the spirit of the Ancestors that resides In the Land and the land is a living extension of the Aboriginal people. My First Experience of Uluru. We headed out early prior to sunrise to be able to have time on the site prior to any tourist buses and large crowds arriving. Upon arrival we found a parking place in middle of the southside. We were pleased to find no other cars or visitors as we arrived. The four of us Shelly, Graeme, Laura and myself were awestruck at the magnificence before us. Earlier, Graeme and I had discussed different routes with the option to return without having to go completely around Uluru. The Uluru Base Walk is a 10km walk (around 6 miles) on a flat dirt path, and takes about 3.5 hours to walk. Climbing up the rock was never an option for us. We all knew it’s culturally insensitive and disrespectful . I was told that the climbing route is a sacred path of spiritual significance that is only taken by few Aboriginal elders on special occasions for ceremonies. But as soon as we arrived and began walking, Graeme and I both knew we would walk around the entire rock. We left Laura and Shelley to walk at their own pace, as they wanted to do the experince at their own pace. Graeme and I felt like we were on a mission and headed off to the east. Another significant reason for our early arrival was to be at the base of Uluru to greet the sun.. The glow of the rising sun now was evident and as the sun rose the glowing reflection of red rock surrounded us. The burst of colors reflected off the sandstone walls was stunning and changing as the sun continued to rise. the surface radiated, first terracotta, yellow, orange and then bathed in flaming red. The vibrancy and intensity of all the colors danced in front of us. As we continued we maintained an awareness that we were following in the footsteps of the ancestors that help shape the landscape. There is a huge diversity of geological features. We still had the entire site to ourselves and this lasted to almost to the very end of our journey. During our walk we saw streams of ants and ant hills which reminded me of the ant hills we have at Cuyamungue. The Pueblo People of the Southwest sometimes use the stones collected by ants as the noisemaker in their gourd rattles. The relationship between human and ant has a deep spiritual significance for them. With great curiosity I watched the waves of activity around the ant colonies. There is a lot we can learn from ants. Ants are good at being social, they very successfully live and work together in large communities, feeding and protecting one another. They raise and care for their young. Life in an ant colony is very organized. Each member has a job to do. When ants builds a nest, they excavate the dirt to to make tunnels, piling it up around the entrance to form an anthill. There may have be hundreds, thousands, or even millions of ants in a single colony. Some of the ant hills around Uluru are quite a bit larger than the ones at Cuyamungue. As I walked the image of these ants stayed with me. I pointed out the ant activity to Graeme as we continued. Towards the end of our walkabout we noticed a very active stream of ants and decided to follow it. It led us up a different path and in the distance we saw a large ant hill. Standing next to the ants’ mound was a rock, which I stepped up on to get a better perspective, and only the did I see that an adjacent engraving in the soil with Aboriginal designs. 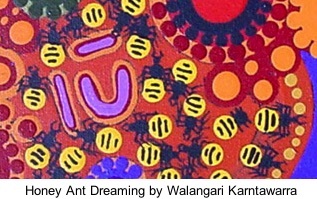 The deep significance of Aboriginal art is complex and reflects the ritual and ceremonial aspects of life for them. Being a novice I truly don’t have a way to evaluate or understand what I was looking at, but felt a deep sense of connection to this site. The ant hill is buzzing with productivity, the ceremonial design etched deep into the red soil was reverberating with a deep and mysterious echo. We left the ant village to finish our journey and complete the walk, back to our original starting place. As we departed I could not get the ant hill and the engraving site out of my head. I hoped to return for another visit but knew that we may not have time. Here I had just traveled around the largest sacred mound, and one of the largest monoliths in the world, and it was the mound of ants that haunted me. I let fortunate that we all agreed to return. We did schedule a return with another early morning arrival at Uluru – about 5:30 AM. As we drive towards Uluru we are amazing at the lightening flashes across the horizon. When we awoke this morning my wife Laura shared she had a strange dream and had awoke with an intense hip some pain which she felt was connected to the dream of the serpent which said we need to tread lightly with the Spirits of this place. As we drive towards Uluru we are amazing at the lightening continues to flash across the horizon. We have had so many synchronistic experiences on the trip we know to pay attention to all the happens around us. As we arrive we decide to split up. The other three, Shelly, Graham, Laura went the opposite direction so I walked counterclockwise around to the East side. I begin my walk on the outer path alone walking in silence with the intention to be open to a greater understanding of what the aboriginal people here refer to “men’s business.” As I began it was very dark out, and I had taken a different route then I had intended. I was walking along the road looking for the inner path and ended up walking quite a distance away from the rock. Finally I found a little path heading towards the rock the sign said path closed ( later I realized that it was only closed in the middle of the day because of high temperatures) and I hesitated for a moment but then I knew I had to go for it. It was a big broad path and all of a sudden in the distance I recognize something. It is a rock which looked very familiar. Could this be the same rock that stands next to the anthill that I discovered just a few days ago. 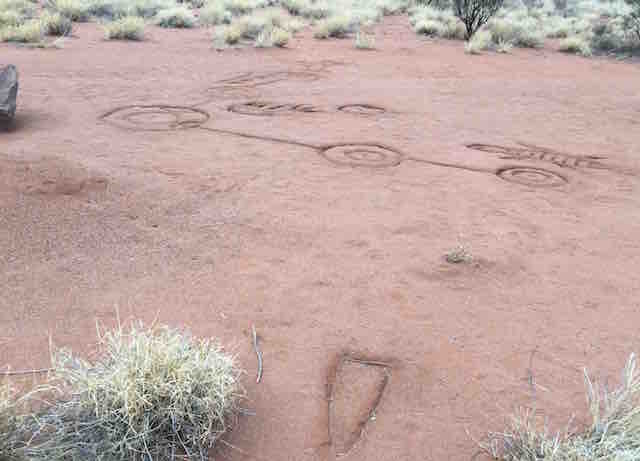 So I wandered down the path and and as I got closer this a design element on the ground carved deeply with seemly deep Aboriginal significance. The story reflected in the drawing is not something I recognize specifically but know this to have great meaning. As I get closer again I see the streaming ant highway for her which appears to go hundreds of feet from another location to growing mound of an ant hill. In the southwest at our Institute we have always honored the ant people as they push stones into a circular mound. It is traditional in the Pueblo cultures after asking permission, to carefully select ant stones to be placed on the gourd rattles for their ceremonies and dances. My Uluru ant hill stands between 2 to 3 feet high. With deep respect I feel I was called here. I sit for a while to ask for clarification on the topic of “Men’s Business” and hopefully to tune in to the energy of this place. After a sitting for a while I know that I must go forward and continue towards the east. My path takes to the perfect place for sunrise. Serpent clouds float on the horizon and the sun cleverly pokes its rays as space allows between the horizon and the passing clouds. The morning songs of birds whistle around me. I now have arrived at the Mutitjulu Waterhole. 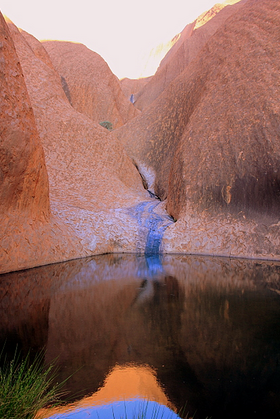 This is a sacred place for the Anangu people, traditional custodians of Uluru. It is a place of creation stories. This water hole that has quenched the thirst of animals and humans for thousands of years. I feel honored to have this mystical place and time by myself. Surrounding above the pool of water is Aboriginal rock art depictng the Rainbow Serpent. I am filled with a tranquility and inner satisfaction. After some time I feel inspired to pull out my journal and make jot down a few thoughts. From my Journal: The clouds roll over the blue backdrop. Drops of rain now sprinkle around me and dance in the surface of the Blessed waterhole. There is a magic to the red glow that surrounds me. The original ones would sing here calling for the release of flow. Daylight intensifies. The shimmer of spirit cannot be denied. The leaves bow create music as the breeze swirls. Gentle voices can be heard in the wind. Listen! Listen the ancestors will speak to those who show respect. Listen!